Royal Enfield has sent out a teaser stating that they will be unveiling their next chapter at the 2017 EICMA auto show. Considering that the retro bikemaker is very close to unveiling its new multi-cylinder bike, which will be a global product, can there be a better platform than EICMA, the world stage for bike manufacturers to reveal and launch their most important new products. What we know about the RE bike so far is deductions from the test mules whose spy shots have been floating around the interweb. The latest ones suggest there will be two variants of the bike: a cafe racer and a street bike. Both bikes seem to be running on the Continental GT’s frame, suspension, wheels and tyres. The frame could have been beefed up to accommodate the extra weight and performance from the motor. We can expect better handling from this chassis setup. The motor looks like an oil-cooled parallel-twin with an engine capacity that is speculated to range between 500cc to 750cc. We expect it to be the latter as it will be closer to the Triumph Street Twin range. We expect the bike to carry fuel injection to comply with Euro IV regulations. Power could be around 45PS and torque around 60Nm. Now, the engine architecture seems to mimic the old-school RE pushrod kind of architecture, but underneath, it could very well be a modern motor. 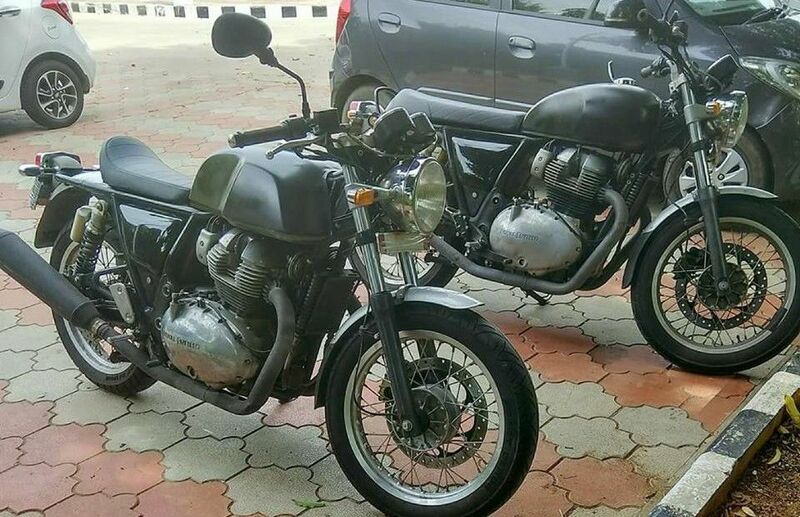 We expect Royal Enfield to be price the new bike substantially lower than Triumph and Harley-Davidson does their equivalent models. Instead of just a formal unveil, if Royal Enfield does decide to launch the new bike at EICMA, we can expect it to be launched in India very soon after, probably at the 2018 Auto Expo. When launched here, it will go up against the Harley-Davidson Street Rod and Triumph Street Twin. Image courtesy: Behind the Handlebar on Facebook.